I am making my way through the first book of the Outlander series by Diana Gabaldon. I saw online that there’s a TV series inspired by the books, but I hadn’t given it much thought until I was given this book by some fabulous friends as a birthday gift – Highland Knits: Knitwear Inspired by the Outlander Series (Interweave.com). 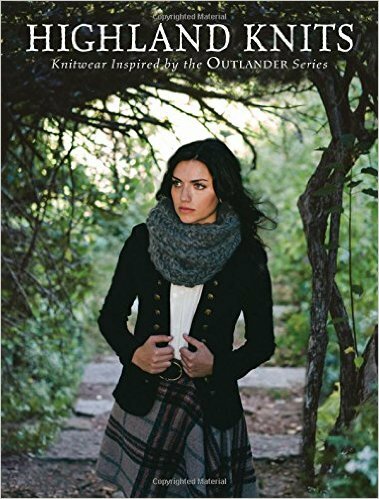 Now not only do I want to check out the show to see who they cast as Jamie Fraser, I need to book a trip Scotland so I can travel through the highlands wearing the fabulous cowl featured in the cover photo of the book! What I really love about this book is that the yarn used is readily available. Some yarns used are Caron Simply Soft, Vanna’s Choice and Lion Brand Wool-Ease Thick & Quick – all of which can be bought at Michaels. Cascade Yarns is featured in a few of the projects as well. At least in Vancouver, their yarn is easy to find and the prices aren’t crazy. I’m not saying it’s cheap but you get what you pay for. As I mentioned earlier, having recently celebrated a birthday, I’ve justified all kinds of yarn indulgences so that I can work my way through this beautiful book. There is a project for every skill level and a variety of items to make. The instructions are clear and well written. The greatest difficulty is deciding where to start.